Having roots associated to shipping from 1775 the Dutch boat builder Hartman does a fast start, launching its first model the 24 Livingstone just a couple of weeks after presenting the project to the media in Summer 2017. 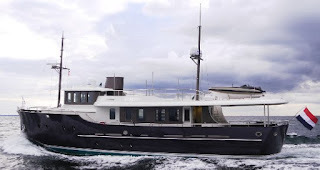 Inspiring itself to the ships of early twentieth century, hence the name Livingstone a famous explorer of the mid nineteenth century, the Hartman 24 is an interesting pocket 24-30 meter size super yacht for those who want a traditional looking vessel with the latest technology. Build of steel the Livingstone 24 offers a standard interior layout of four double cabins below deck with a forward owners stateroom, and a laundry room. Power for the Livingstone 24 comes in two options. Hull one featured a single Man 345hp with an available option being for a twin installation of the same engine.